My thoughts this morning are centered around the time of year. 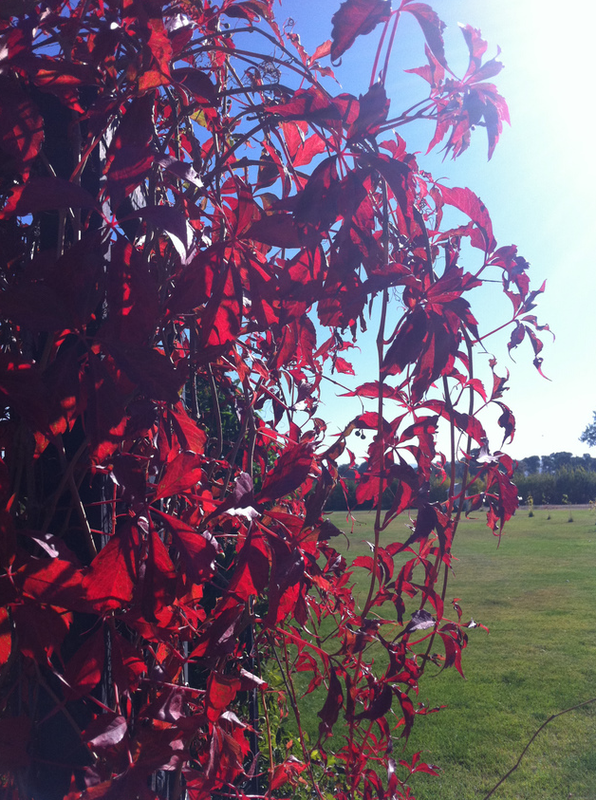 The leaves are turning colors, getting ready for a winter sleep. This process of change, of preparing for a period of dormancy is a pattern in our lives too. A new baby makes me think of spring, a walk in the autumn air with an aged loved one makes me think of fall. There is something about this turning I can’t quite explain. I think it is because it feels like something of a paradox to me. There is sadness in the knowledge of expiration, of a season’s growth and lifespan being completed and spent. Perhaps even a hint of dread for the quiet that is waiting around the corner. Yet, at the same time there is great joy and satisfaction in the results of a productive and full lifespan; a reminder that after the sleep will come a new season of renewal and new beginnings. It is odd that there can be both conflict and peace within the concept of turning. And yet, these are the thoughts tumbling around simultaneously in my head this morning. There’s also the concept of clean up of that happens in the fall. The time when you’ve reaped your harvest and it’s time to clear the expired corn stalks and other plants away. 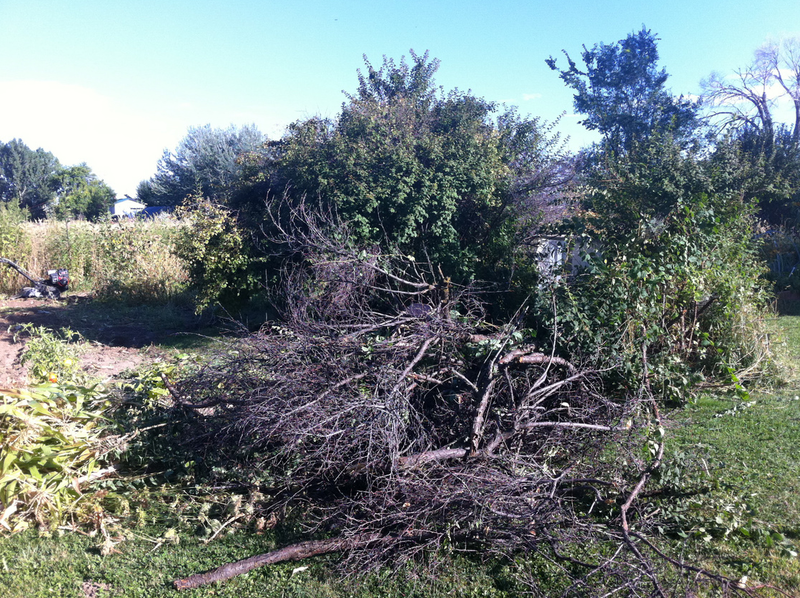 This past weekend, I helped work on clearing the corn patch at my parent’s, I also took on getting some of the dead branches out of an old choke cherry bush. As I looked at the results of the work, I was struck with how often I should be doing this in my own life. How, I need to be looking for habits, choices, etc. that are in need of being cleaned out. This process is painful. I came home with many scratches from branches not wanting to be disturbed, and sore muscles from roots desperately trying to hold their ground. And as I look at this picture, I am filled with satisfaction and hope of what the results will bring next spring. So it is with me. Old habits die hard, but the promise of better ones to replace them are worth the pain and effort. I don’t want to look back on my life and regret time wasted. Perhaps a little less time spent playing games or socializing on the computer and a little more reading, reflecting and writing. Perhaps a little less time worrying about others and more worrying about myself. I’m feeling a sense that I need to follow nature’s lead this season. I’d be lying if I said these thoughts don’t also cause a slight pang in my heart when I think of loved ones. This picture describes the very visuals and precious memories that I’m trying to describe. 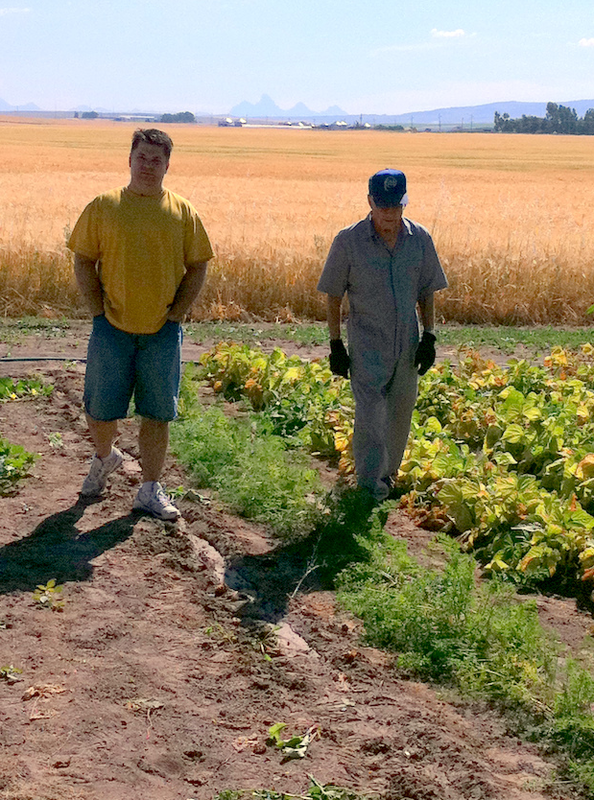 This is my husband walking and talking with his grandpa in his garden. Grandpa Melvin turned 90 this year. How we love this sweet man. This picture sums up his amazing life of farming, teaching, loving and sharing. How can I help but want to keep him with us? Yet, knowing the joy that is waiting for him when he crosses this life’s veil, when he will be reunited with his sweetheart and loved ones on the other side causes me to also want for him to be able to go. I am back at my paradox. Turning is hard. Turning is necessary. Turning is progress. Turning is good. I know what you mean. I’m going to miss my dad when it’s his time. He’ll be reunited with mom, but I’ll still miss seeing the both of them.